Path Lab Delhi | Labs in Delhi | Diagnostic Lab | Pathology Testing Lab : PREVENTIVE HEALTH CHECKUPS – WHICH ONE TO SELECT? PREVENTIVE HEALTH CHECKUPS – WHICH ONE TO SELECT? In today’s fast paced and stressful lifestyle, health often takes a backseat. This often leads to diagnosis of a number of ‘lifestyle’ diseases and medical problems which includes blood pressure, hypertension, high cholesterol, diabetes, thyroid etc. Instead of getting diagnosed with such problems at a later stage, it is always a good idea to go for regular preventive checkups which includes full body checkups so as to understand where exactly you stand health wise. Many hospitals as well as diagnostic labs have come up with a number of health packages for the benefit of working professionals who want to get themselves diagnosed but often avoid or postpone it, either due to lack of time or the high charges which these tests require. The best part about these health packages is that all the tests are to be performed at one time and are reasonable costs. 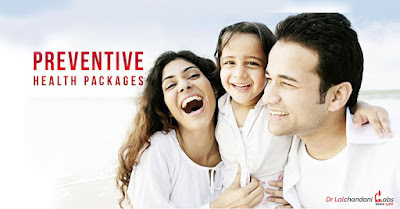 Let us now take a look at some of the popular packages which are offered. This complete body profile package contains wide range of medical tests like sugar, thyroid (T3 and T4), lipid (heart) profile, liver and kidney related tests etc along with the complete blood count and electrolytes. This is the perfect package for all those of you who have been diagnosed with diabetes or blood sugar because this test includes all the organ tests which come into play and get affected due to blood sugar. Hence, this package typically involves apart from sugar fasting as well as PP, lipid profile, liver and kidney tests, urine screening etc. Understanding how delicate the health of senior people becomes, there are health checkup packages for senior citizens as well. These include some common tests like blood sugar, complete blood count, kidney function test (urea and creatine), liver tests etc. Besides this, for male senior citizens, there is the PSA total (Prostrate gland) test also which is conducted. A woman’s body undergoes infinite number of changes whether it is during pregnancy or menopause. There are so many hormones which come into play, that they affect the woman’s body in some way or the other. In order to understand what is going on inside your body, there are specially designed female wellness profile package which includes all major tests which a woman must undergo right from complete blood count to diabetes to thyroid to bone strength, iron check etc. Want to go in for an all round or complete head to toe kind of a medical examination? Then go for the Gold or Platinum health check up. These packages cater and include all possible medical tests just so that you are sure that you leave no stone unturned when it comes to dealing with your health. Preventive health checkups are a smart way to keeping good health. Not only are these cost effective and convenient, but at the same time, they help you to be aware of your health condition so that if you get diagnosed with anything, you can start your treatment right away. The checkup packages offered by at Dr Lalchandani labs is the best in the market because not only do they offer all medical tests at reasonable rates, but they also offer pickup and delivery options for collecting the samples and provide test results within approximately six hours which is impressive. Great information. We are here the best Hormone Test Lab in Delhi NCR . We offer high quality Hormone test services to customers at very reasonable rates. For more details visit here.